Is bothersome bass running your sound quality? You don’t need to settle for subpar sound. Our stylish Blue Acoustic Foam Bass Traps help to absorb low frequency sound waves and look great while doing it! Blue Acoustic Foam Bass Traps. Made in England. Absorbs low frequency sound wave energy (bass) and prevents indirect sound waves. Has an NRC rating of 0.85. 25% more effective than the industry standard. Install within home cinemas, recording studios, clubs, concert halls and much more! UL94 approved and exceeds UK Fire Safety regulations. Please note that these Blue Acoustic Foam Bass Traps should not be used for the sole purpose of soundproofing. Use for acoustic treatment to improve sound quality. Manufactured in house to ISO 9001 standards. When trying to tackle bass, acoustic foam panels don’t quite hit the mark. Low frequency sound waves contain much more energy than mid to high frequencies and require thicker pieces of acoustic foam to control. Bass Traps offer the ideal solution for those experiencing interference due to low frequency sound waves. When used alongside our acoustic foam tiles, you can effectively protect your room of choice from frequencies ranging from low to high. We’ve manufactured these Blue Acoustic Foam Bass Traps to fit perfectly into room corners. This is where bass naturally travels to, as such, it is important to properly treat these vulnerable areas. Simply mount them using a spray adhesive (not included) and notice the immediate difference. For maximum effect, stack bass traps both horizontally and vertically along room corners, filling the centre with acoustic foam corner cubes. 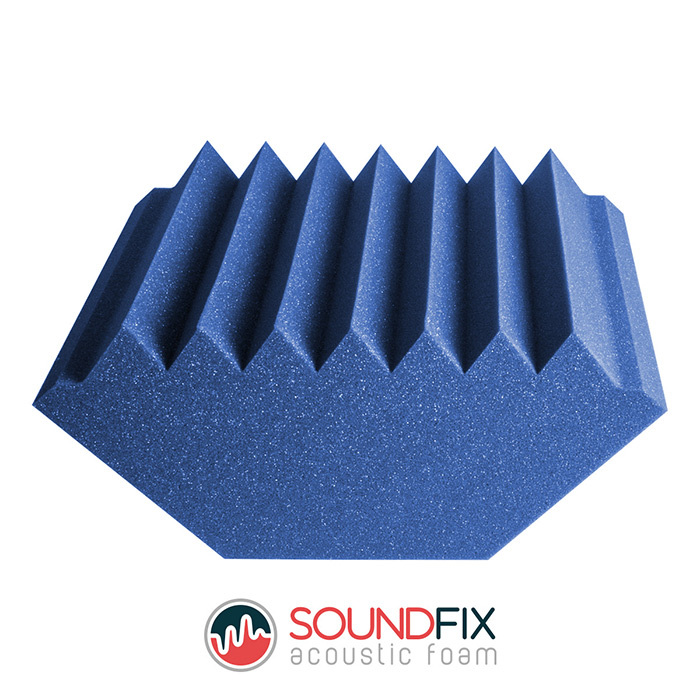 You don’t have to have a recording studio to benefit from the Blue Acoustic Foam Bass Traps. In fact, many of our customers use them to acoustically treat a wide variety of rooms. This ranges from home cinemas to concert halls and other event venues. Wherever bass may be causing a problem, this product can offer the solution. Why Choose These Bass Traps? These vibrant bass traps offer an aesthetic alternative to regular grey acoustic foam. All of our products are manufactured to the same high standard using only the best materials. Our acoustic treatment products are manufactured in-house to ISO 9001 standards. They are UL94 approved and exceed UK Fire Safety regulations. With an NRC rating of 0.85, you’ll struggle to find a bass trap with higher sound absorbing qualities. On average, our acoustic foam is 25% more effective at absorbing sound wave energy than the industry standard. When you place an order with us, you’re buying direct from the manufacturer. We create everything we sell using highly advanced CNC cutting equipment to ensure a pristine finish time and time again. Being the manufacturer of this product allows us to offer it to you at superior rates. There’s no “middle-man” which means no additional mark-up. We’ve been manufacturing high-quality foam products for more than 40 years and will gladly offer our expertise to you. If you need to know more about one of our acoustic foam products, please contact us. We’re always happy to help! Seems I'm not the only one that likes your bass traps and rightly so! No issues ordering here. Quick delivery and fair prices. These bass traps work well and look good. Decent company to deal with the acoustic foam is high quality and the delivery times are fast. Cleanly cut and fit well in the corners of my room. The blue looks amazing. A superb range. I've bought the blue tiles, bass traps and corner cubes and love them all. Awesome bass traps. Arrived the day after I paid for them as well. Decent quality and cut very exact. The blue looks really nice in person as well, worth the extra couple of quid if you can spare it. Finally got around to buying a few of these, couldn't resist the blue even if they were a tad more expensive. Really impressed. Fair price and fast delivery. Happy to pay that little extra for the blue colour. Looks awesome! Was sceptical over how effective these bass traps might be but I must say they've made a big difference. Had some bass traps before and these blow them out of the water in terms of quality. Bought with the blue foam tiles great kit give the room a more professional feel. Great company, pleased with the price and how fast delivery was. Perfect, arrived when stated and no problems. fantastic service from GB foam, excellent work guys. I was amazed by how much these bass traps made a difference to the sound quality. Worked like a charm, my recording studio doesn't get any bass feedback anymore. the studio now sounds great and looks amazing. Very pleased would buy again. Made an immediate difference to my recordings. Less time post production now cleaning up the sound. Thanks! Happy with my order. Arrived on time and appears to be a quality product. High quality for the price, already noticing improvements in the sound quality. Definitely, buy them with some tiles. Brilliant service and a very good product. Very proffesionally made at a price I couldn't argue with. The blue looks really good on these. My favourite colour. Very nice bass traps and a great service received from GB Foam. Really nice bass traps, awesome colour! !